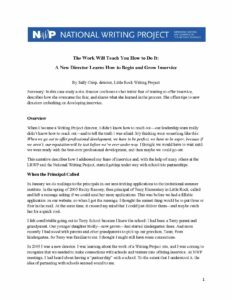 Summary: In this case study, the author reflects on how her writing project site moved from an inservice neophyte to a partner in several multiyear programs with local schools. She raises dilemmas (such as: Are we ready to do this? If the PD we offer isn’t perfect, will we ruin our name/reputation? Who should we contact?) and shares strategies for confronting them. As the title suggests, the director and teacher leaders in Little Rock learned how to do the work by doing the work, and this case study would be a great read and tool for other sites who find themselves taking a leap into new partnerships. “The work will teach you how to do it” is an Estonian proverb my husband and I came across some years ago. It’s been a sort of mantra at our house over the years. We’ve found it true again and again. That first year I learned much. I learned because I was there. Now when I have the opportunity to plan with teacher-consultants who will be hosting and coordinating a new partnership, I can work from my knowledge of having been there “on the ground.” I would say I learned what I might have expected to learn, and I also learned much more. For one thing, I learned it’s good to have chocolate at after-school meetings! I learned that even very experienced, very professional teachers can be open to new ideas, to change. (I think of Nona’s saying she put away practices of many years, like dictating writing to the little ones.) I learned that the teachers were willing and even eager to dig into professional literature for theory and especially for best practices. I learned more at every meeting with them about their individual and collective commitment to best practices, to their students, to Terry School and to success with all the children there.